The Markets continued to modestly correct and end the day once again in a red in a volatile session after a positive opening. The Markets saw a positive opening and formed its intraday high of 8837.30 in the very early moments of the trade. After remaining briefly in the positive the Markets pared its morning gains to trade flat. It waited for the much awaited RBI Credit Policy and this stood out on expected lines as the RBI kept its benchmark rates unchanged and lowered SLR by 0.50% or 50bps. After some initial knee jerk reaction, the Markets drifted lower to form the day’s low of 8726.65 in the mid afternoon trade. It saw a very sharp recover soon after to trade very near to its previous close recovering much of its losses. However, it drifted again and the Markets finally ended the day at 8756.55, posting a net loss of 40.85 points or 0.46% forming a lower top and lower bottom on the Daily Bar Charts. Expect a quiet start to the Markets again as the RBI Policy review remained a non event on expected lines. Speaking on technical terms, we will continue to see the Markets remain in consolidation and in corrective mood. The levels of 8640 will continue to act as a good pattern support at Close levels in the immediate short term. 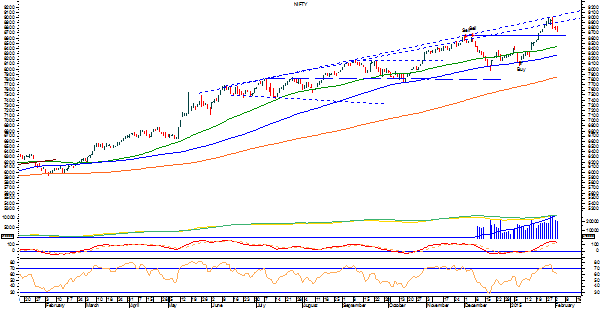 The levels of 8830 and 8895 will remain immediate resistance levels for the Markets. The support will come in much lower at 8640 levels. The RSI—Relative Strength Index on the Daily Chart is 60.9686 and it remains neutral while showing no bullish or bearish divergences or failure swings. The Daily MACD continues to remain bullish trading above its signal line. On the derivative front, the NIFTY February futures have added over 4.26 lakh shares or 1.71% in Open Interest. This signifies that some amount of shorts seem to have been added in the system. Coming to pattern analysis, as mentioned in our previous editions of Daily Market Trend Guide, the Markets are correcting after forming its immediate top. The Markets will remain in some corrective mode in the immediate short term but the pattern support at 8640 will act as important levels to watch out for. Apart from technical structure which certainly remains mildly bearish, the outcomes of Delhi elections will also cast its effect on overall sentiments. Given this thing, overall primarily dominated with little bearish technicals, the Markets may see itself continuing to correct. In event of any up move, the Markets will continue to trade in a broad trading range. Secotoral out performance would continue. While maintaining enough liquidity, selective approach is advised for the day.